Each year, the taxicab industry spends approximately $800,000 to fund a series of sting operations that attempt to find drivers who illegally pick up fares off-the-street. Though the aim is to crack down on the litany of underground taxi services that operate in L.A. with, basically, no regulation, the sting operations often result with the arrest of an Uber of Lyft driver, who feels they were unfairly &apos;entrapped&apos; by a misleading sting operation. As KPCC reports, more than 200 ride-hail drivers have been arrested by LAPD through these stings. Back in 2006, the Board of Taxicab Commissioners put together a plan to crack down on so-called bandit cab companies, that operate scot-free from the stringent regulations officially sanctioned cabs have to follow. It&apos;s no secret that in certain parts of town (Koreatown and East Hollywood especially) underground taxi services offer cut-rate rides, and, at the time, the Board of Commissioners just wanted them to stop. To do so, the Board worked out an agreement with cab companies to earmark $30 each year from each cab to pay LAPD and the L.A. Department of Transportation to crack down on the bandit cabbies. For for the seven years between when the plan was enacted and when Lyft and Uber arrived in Los Angeles, LAPD conducted sting operations on the bandit cabs with relative success. The problem started in 2013, when Lyft and Uber began operations in Los Angeles. 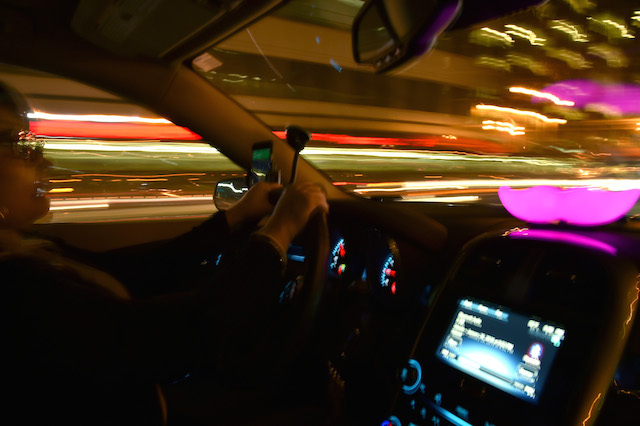 Since then, hundreds of Lyft and Uber drivers found themselves caught in LAPD sting operations that the drivers say were nothing more than simple traps. For example, the KPCC story tells us about a woman named Vanessa. While driving in downtown L.A. last year, Vanessa saw a woman supposedly wildly waving her arms in her directon. When Vanessa pulled over and asked if she was okay, the woman replied, in a hasty and urgent manner, that she needed a ride. Vanessa figured the woman could use the Uber or Lyft app to set up a ride, but the woman had only a flip phone. She offered Vanessa cash, and Vanessa, apparently reluctantly, accepted the ride. LAPD officers rolled up moments later, and placed Vanessa under arrest. Vanessa&apos;s experience isn&apos;t unique. Last year, three Uber drivers who were arrested in similar sting operations said they were victims of entrapment by the LAPD. In each case, the driver was flagged down by a woman vigorously waving. "Bandit cab laws apply the same way to Lyft and Uber drivers, as they would to the driver of a bandit cab," said Eric Spiegelman, the President of the Board of Taxicab Commissioners, to LAist. "Any of the Uber or Lyft drivers who were arrested are drivers who are accepted &apos;street hails.&apos; One of the main differences between taxis and Uber and Lyft is that taxi cabs can accept street hails. Lyft and Uber must accept their hails through an app." But Speigelman also noted that the Board is currently evaluating the sting operation procedures in order to make sure that they&apos;re working correctly. As he emphasized, there is a difference between busting bandit cabs, and arresting unsuspecting Lyft drivers. An L.A. Times analysis determined that the industry lost nearly a third of its ridership during the two years following Uber and Lyft&apos;s arrival in L.A.